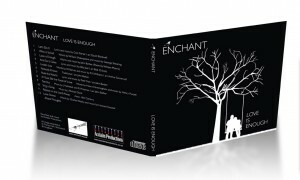 ENCHANT is a group of enthusiastic singers who have met through churches, musical groups and various revelry. Although we are all involved with other choirs, Enchant offers us, and our audiences, a taste of something other than the standard choral repertoire. We originally got together to sing for a friend’s wedding, and have since premièred several new works by John Barber, performed on local radio and had many bookings for wedding ceremonies and charity concerts. We have made many friends through our work with Enchant, and have done several joint concerts with Warley Male Voice Choir, the Harmonics barbershop group, and soloists including Leon James and Martin Evans. We enjoy singing a wide range of music. To get an idea of the kinds of things we do, see our full repertoire list. Sorry, there aren’t any upcoming concerts right now.